This is so inexpensive! The people who don't know anything about the kink world won't be alarmed. The people who ARE in the "lifestyle" will scoff at first...but give it a minute. I mainly call this "My Ridiculous Costume Tie", but that's an affectionate nickname. Sometimes, people realize it's the tie from the cover of 50 Shades of Grey. Mostly, though, it's not for them; it's for me. This kind of thing really puts me in "topspace". I'm always "a dom", but sometimes I don't FEEL like topping. This sort of costume is great for putting you in the mood. This is surprisingly well made. It's a very sturdy tie and CAN be used as a light restraint. I wouldn't recommend it for any real resistance-oriented scene, since the design of the material is kind of coarse...but maybe you like that? This is super discreet! I wear it with suits using a double-Windsor knot, but I'm considering a single-Windsor stint, just to see how it goes. Most people don't even notice. It can be used to tie hands or feet together, but I have cuffs for that and would only use a tie "in an emergency". Welcome back to reviewing; it's been almost a year! Then you might be happy to hear they are revamping the review system this fall, so things should pick up around here! Welcome back and thanks for sharing! 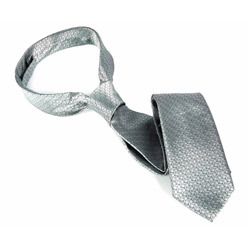 Thank you for viewing Fifty Shades of Grey Christian Grey's tie – cuffs review page!